Author(s): Arjun Kumbhar, Department of Chemistry, Padmabhushan Dr. Vasantraodada Patil College, Tasgaon, 416312, M.S., India. Rajashri Salunkhe. This review mainly discusses the various supporting tactics that have been used for the immobilization of Pd complexes, and Pd nanoparticles typically on biopolymers, and the different characterization techniques used for the resulting catalytic materials. The discussion also focuses on the detailed catalytic applications of these catalysts in various organic transformations such as oxidation, hydrogenation and C-C cross coupling reactions including Mizoroki-Heck, Suzuki-Miyaura, Sonogashira, Stille and Tsuji-Trost reactions. 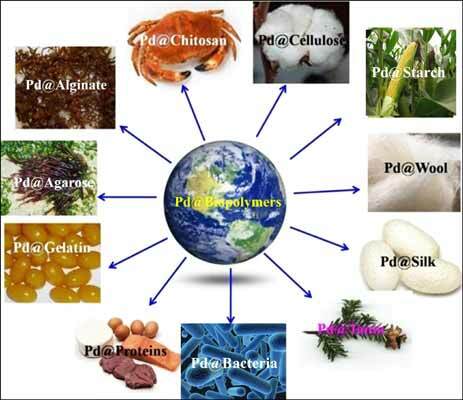 Keywords: Palladium, heterogeneous catalysis, biopolymers, coupling reactions, hydrogenation. Affiliation:Department of Chemistry, Padmabhushan Dr. Vasantraodada Patil College, Tasgaon, 416312, M.S., India. Keywords:Palladium, heterogeneous catalysis, biopolymers, coupling reactions, hydrogenation. Abstract:This review mainly discusses the various supporting tactics that have been used for the immobilization of Pd complexes, and Pd nanoparticles typically on biopolymers, and the different characterization techniques used for the resulting catalytic materials. The discussion also focuses on the detailed catalytic applications of these catalysts in various organic transformations such as oxidation, hydrogenation and C-C cross coupling reactions including Mizoroki-Heck, Suzuki-Miyaura, Sonogashira, Stille and Tsuji-Trost reactions.